Out of the books I read this year, my top ten are almost all science fiction and fantasy, and heavy on young adult novels. It was a good year. 2. Over the Christmas holiday I finished Ready Player One by Ernest Cline, and before I was even a fourth of the way through I knew it would be a favorite this year. Ready Player One is for every geek who was raised in or loves the 1980s. If you were a gamer, or you know 80s sitcoms, or you can recite lines to every John Hughes film like I can, this book is like a big, sloppy kiss just for you. Okay, it’s more of a kiss to the gamers of the 80s, which I was not, but even though those gaming references were over my head, this is just one hell of an action-packed romp. Go read Jodi’s or Christa’s reviews to hear more about it, or better yet just go read the book. It’s that good. 3. Maureen McHugh’s short story collection, After the Apocalypse, is more than it sounds. I know it sounds like stories dealing with zombies or out-of-hand artificial intelligence or a future disease-ravaged planet, and the stories do involve these things, but they’re so much more. For instance, “The Naturalist” is not really about blood-thirsty zombies, but it’s about how the world is dealing with the zombies, which are put in their own preserve, and we really look at them and even start sympathizing with them. They aren’t just scary creatures that we know are the enemies but it dives in so much deeper. This collection takes these apocalyptic themes one step further and relationships between characters are really analyzed and not always resolved. The stories are surprising, interesting, and hauntingly realistic. I’m still working on a full review of this collection because I need to re-read some of these stories. 4., 5., & 6. Patrick Ness is all over my best-of list this year. From now on, I will obsessively read anything he writes. Besides A Monster Calls, I read his Chaos Walking trilogy this year which made me want to punch him in the face and hug him at the same time. That takes talent. He sucked me into the future world he created and I loved and cheered for the characters while I cried for and cursed them. Stupid, awesome Patrick Ness. 9. I just finished Brian Selznick’s The Invention of Hugo Cabret, and what took me so long? It’s not like I hadn’t heard of it. I think this is the case of too many books to read and not enough time. I’m sure this made best-of lists years ago, but it’s finally hitting mine now. The story is set in the early 20th century and follows young Hugo, who lives in a train station maintaining the clocks, and his passion for automatons. Using his deceased father’s notes, he works on an automaton he recovered from a destroyed museum, but problems start happening for him when he meets some eccentric people who are interested in his automaton. Easily the best parts of the book are the illustrations. The book is over 500 pages long, but over 200 of them are gorgeous illustrations. I found myself longing for more of them and less words. I even cursed when I read things that would’ve been drawn beautifully. This book is solely on my top list for the gorgeous illustrations that mimic the silent films that are discussed throughout the book. Great. Honorable Mentions: I can’t help but throw three honorable mentions into the mix. I don’t think these are the best books of the year, but they made me smile or laugh out loud, and that has to account for something. Anya’s Ghost by Vera Brosgol restored my faith in graphic novels, and I can’t help but love Tina Fey’s Bossypants and Mindy Kaling’s Is Everyone Hanging Out Without Me? (And Other Concerns) because I really admire smart, funny women. Grab any of these if you need a pick me up. 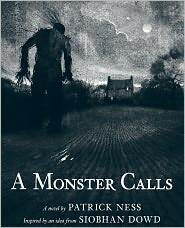 OMG, I just bought one of Patrick Ness’s books and can’t wait to sink my mind into it. Love your top ten list. I just read Hugo this year too, and my daughter read it and then my son read it. We just bought Selznick’s new book and can’t wait to read his next visual masterpiece. I just finished Mockingjay and can hardly wait for the first movie. I would recommend the Birthmarked series, the last book comes out in 2012 and they are great teen sci-fi in my opinion by a MN author. @Laura (Booksnob), Laura, I’ve been reading about the Birthmarked series on your blog and I did add it to my to-read list! It sounds like it’s right up my alley. As for Patrick Ness, I think you’ll love him. He has one way of warming your heart and squeezing the life out of it at the same time.